I first discovered Dust Moth when producer (former band member / keyboardist at the time / former Minus the Bear / amazing producer and engineer), Matt Bayles shared their “Selector” video on social media. Anyone that knows me or has ever read anything I have ever written on this site, knows that if you can make some decent heavy music with dreamy vocals, I will love that band forever. Well, luckily for me Dust Moth doesn’t just make remotely decent music. They actually make insanely great music. To this day “Selector” and the rest of their debut EP, Dragon Mouth is easily one of my favorite releases in the last five years. When I found out the band was on tour with Kayo Dot last summer, and that they would be making a stop in SLC I was all about it. I was super surprised when only four band members took the stage instead of the six members featured on Dragon Mouth. But let me tell you this, the paired down line up was not lacking. When Dust Moth took the stage as quartet, they absolutely blew me away. Their set that night also featured several songs that I hadn’t heard before and I couldn’t wait to get a recording of the new stuff. 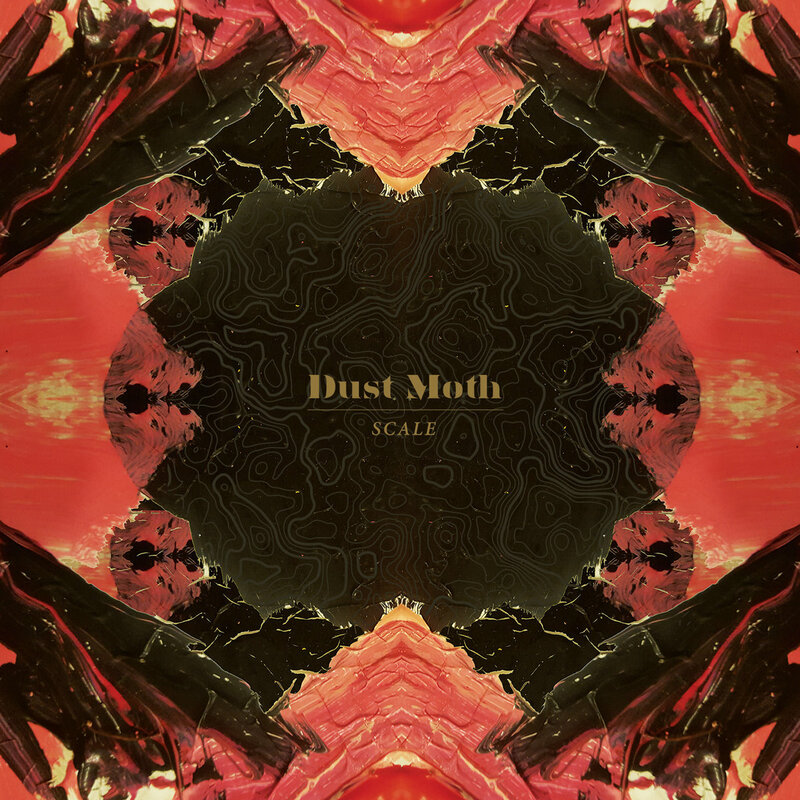 I was excited as that day finally arrived when Dust Moth dropped their first LP, Scale (full review here) a couple of months ago. All the anticipation I had to get my hands on this record paid off. Everything I wanted from Scale, I got. Heavy-doomed-gazy-progeessivness with dreamy yet powerful vocals on top. Serious musical perfection! As I do with every band I get obsessed with I have to know more about their writing process and what makes them tick as band. So here’s a break down from Dust moth vocalist keyboardist Irene Barber (XVIII Eyes, Erik Blood) and guitarist Ryan Frederiksen (These Arms Are Snakes, Narrows, Undertow). 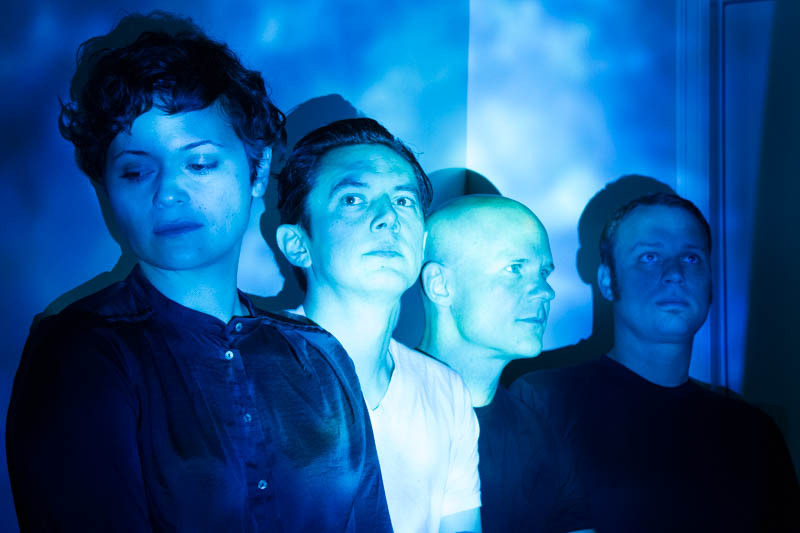 We touch on how they function as four piece band, the writing process for Scale, and what the future has in store for the Dust Moth. Dust Moth went from six members down to three (temporarily) and now back up to four. Why the mass exodus of band members? Were they not able to tour / commit fully to the band? Irene: It wasn’t so much of a mass exodus as it was a slow transformation. The band just evolved into what works, but yes, some of it had to do with busy schedules / availability. So was Scale recorded with Justin Rodda on drums? He has since been replaced with Jim Acquavella. What was the reason for Rodda’s departure and how did Acquavella come to be in the band? Irene: Yes, Justin came into record with us when we lost our original drummer. He did an amazing job. Jim is our permanent guy now though. Steve and Jim have known each other for a long while – they played in a band called Bronze Fawn together, which happened to be one of my favorite Seattle acts. That’s how I met Jim, playing out and about when Bronze Fawn were still together. It’s super cool to be playing with him now, years later. I feel like with past records the songs would always really start to take shape after playing them on tour night after night. I was at your SLC show last summer where you opened up for Kayo Dot and you all expressed your excitement for the new material and how the simplified band lineup was really helping the new songs form. Do you feel like that mini tour was really essential to how the songs on Scale were formed? Ryan: In a way, yeah. I feel like with past records the songs would always really start to take shape after playing them on tour night after night. It was just becoming familiar with each song and getting comfortable actually playing the song. So we had planned on recording after that tour for that exact reason. We had demoed a lot for Scale and the songs would each change with each demo of the song as we were able to hear what works as a whole rather than just our individual parts. It’s so easy to just get caught up in your own playing before recording that I think songs sometimes suffer as a result of that. In a previous interview Ryan had talked about their being more space for the three of you to insert yourself into the songs. Is that the main difference between the writing process from Dragon Mouth and Scale the extra space? Ryan: Nah. While that’s a big part of it, it was also the fact that there were essentially only 3 of us writing Scale. Also, Steve wasn’t in the band when we recorded Dragon Mouth and his playing style is vastly different from both JC and Jacob’s(JC was our original bass player and Jacob filled in for JC when he couldn’t be there and then took over for a bit when JC moved to the Bay Area). Having the extra space was more of an added bonus. It wasn’t necessary as we were used to writing as a 6-piece but to not have to analyze everyone else’s parts to make sure notes aren’t rubbing and ultimately fitting together is pretty liberating. Scale, to me, ended up being about forward movement, reaching outward in unknown spaces, and the patterns and repetition involved in that. Is there an overall all theme or vibe either musically or lyrically that Scale represents? Irene: We didn’t set out to write with an overall concept in mind, but the record ended up having some overarching themes. Scale, to me, ended up being about forward movement, reaching outward in unknown spaces, and the patterns and repetition involved in that. I think this in line with what is happening musically on the record, and it’s sprinkled throughout lyrically as well. Having not seen the physical artwork for Scale yet I really feel like the album cover matches the vibe of the albums music perfectly. I read that Irene was in charge of the artwork. Any particular inspiration behind the albums visual representation? Irene: I kinda feel the same way. How did that happen? Ha! The artwork started with a piece by Dwight Jonsson, a painter here in Seattle. I was flipping through some of his paintings and when I saw the colors and textures in this one, I felt like it matched our vibe really well. I sliced and diced it to give the artwork a cavernous, kaleidoscope look to further try and capture the feel of the record. It’s hard describing your own sound, you know? All I can say is, his list is scary accurate as far as the range of acts that influence us. In the press release for the new album Brian Cook (These Arms Are Snakes, Botch, SUMAC, Russian Circles) name drops some pretty incredible acts including Led Zeppelin, Jawbox, Doves, and Chelsea Wolfe after hearing the album and re-reading his write up I think that combo of sounds / bands actually does a really good job describing Dust Moth’s sound. Do you agree with this combo? Any that you would add or subtract? Irene: It’s hard describing your own sound, you know? All I can say is, his list is scary accurate as far as the range of acts that influence us. Ryan: I think Brian is very astute when it comes to describing bands. It also helps that we sat in a van for years together listening to all those band’s records. Haha. Seriously though Brian understands where we’re coming from and what we’re trying to achieve so I think we knew he’d flatter us a bit when he wrote that. Haha. But yeah, I really do think he nailed us down pretty good. After having so many band members and now simplifying the lineup do you envision Dust Moth adding any additional members again? I thought the live show functioned amazingly as a four piece. Irene: That’s great to hear, thank you! It feels really good being a four piece. We’re interested in growing/adding to the sound going forward, but we’re hoping to do it without adding additional members. Just additional synths ;). Ryan: Yes thank you very much! That is fantastic to hear. We lose a little bit sonically as far as more musicians but I think we gain clarity with less going on and we obviously get to move around a little bit more on stage. Haha. That certainly helps. After seeing you live I need more. Any upcoming touring plans? Irene: Aw, thanks! Nothing is solidified yet, but we’re working on it. Any updates or new material coming out for any of your other projects? Irene: I’ve been in the studio here and there trying to finish up recording some solo tracks. Very laid back, but it’s coming! And I know Steve has got a whole new record cookin’ for Giza – super excited for that. Ryan: We’ve been concentrating on getting this record out and playing out for it so we haven’t written a whole lot of new material that is reminiscent of an actual song but we have a lot of moving parts that are finally starting to gel together so we’re excited for that. I actually have a ton of stuff compiled that doesn’t really fit into any of the bands I’m currently in so I’m currently refining all of that and having friends come in and play on it. It’s more of an ambient/textural kind of thing so hopefully I can get that out sometime soon. Next ArticleThe Beatles: Live at the Hollywood Bowl | A Terrible Live Band?